Even after the first spring melt, the snow would remain on the frozen surface of Conneaut Lake. Capitalizing on this natural resource, the Conneaut Lake Ice Company was established in August of 1880 on a narrow strip of land on the southeastern edge of the lake. The Conneaut Lake Ice Company created large ice houses for storing, packaging and shipping ice harvested from the lake. Conveyor Belts: Used to harvest ice during the time when the Conneaut Lake Ice Company was in operation. ~ Source: Briggs Brothers Pinterest page. 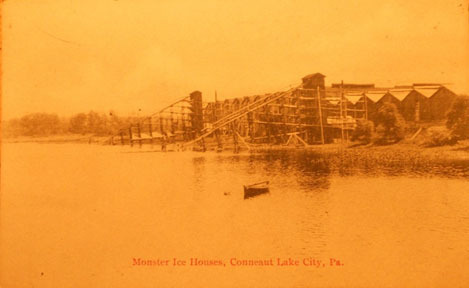 The Conneaut Lake Our Town Team, “Ice Industry,” NW PA Heritage, accessed April 26, 2019, http://nwpaheritage.org/items/show/20.